In 1967 I married a Dallas girl. I have often wondered why my mother-in-law allowed this to happen. Her name was Mary Dykema, and she certainly gave me the benefit of the doubt. Of that commodity, doubt, there was plenty. I had no job nor any prospects for one. I was a student at Harvard Divinity School, with some thoughts of being a writer. But she had met my parents and knew that I came from good Panhandle stock, and maybe that fact, coupled with prayer, got her through the wedding. Actually, the wedding pictures suggest that she enjoyed it. I can't account for her pleasant appearance. In her place, I would have been terrified, yet she was smiling throughout, and I happen to know that she was sober. Maybe she saw something in me that wasn't obvious, but even she couldn't have predicted that within five years, I would be making my living as a cowboy and that her lovely daughter and I would be living in a trailer house in Beaver County, Oklahoma, thirty miles and thirteen cattle guards from the nearest town. She never gave any hint that Kris might have made a big mistake. She often came to visit us in the North Country, and it always seemed to spawn some wild adventure. There was the day Kris picked her up at the Liberal, Kansas, airport in our little Ford Pinto. Driving back to the ranch over rough roads, they high-centered in some sand and separated the muffler from the tailpipe. Kris didn't know what she had done, but did notice that there was less scraping and grinding when she drove in reverse, so they made the last seven miles of the trip driving backwards. The ranchers and cowboys in our neighborhood were keen observers of all signs and tracks. They went nuts trying to figure out who had left all those swerving tracks in the road, and why. Then there was the day we had to drive Grandmother thirty miles to catch a bus in Forgan. It was snowing when we left the ranch and we had difficulty getting through. When we finally reached the blacktop, we arrived just in time to see the bus go streaking past. We chased it sixty miles in blinding snow, and finally caught up with it in Buffalo, Oklahoma. There, Grandmother climbed on the bus and went back to Dallas. I wasn't sure she would ever come back, but she did, and her visits from then on seemed to trigger weather catastrophes. In 1989 she came to spend Halloween with our kids, while Kris and I made a little trip together. It snowed. Grandmother was marooned for two days with our children, and watched the videotape of Disney's "Robin Hood" thirty-seven times. She spent Easter with us in 1991. It snowed. She came the following Thanksgiving and we got a blizzard. One year she came early in the season, near the end of September, a full month before Panhandle winter is supposed to set in. It snowed. 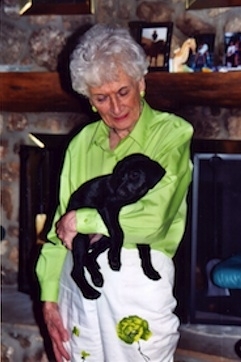 In spite of it all, she came back to the ranch in 1996 and spent Thanskgiving with us. The weather was perfect, beautiful, warm and clear. At last we had beat the jinx. Two days later, at 8:30 in the morning, we looked out the window and saw...big silver-dollar snowflakes blowing sideways in a twenty-mile-an-hour wind. The road out of the ranch was drifting over. We were 19 miles from the nearest well-traveled highway. By my calculations, we had about one hour to get her out. "Well, Mary, you've done it again," I said. "How important is it that you make it back to Dallas in the next three or four days?" Perhaps she had visions of watching "Robin Hood" again. She packed in ten minutes, and we used a four-wheel drive vehicle to get her to the airport. My mother-in-law not only had the prettiest blue eyes in Texas, but she was also a heck of a good sport. She got plenty of adventure just visiting us.